When you’re away from your broadband connection, you can dial out using your laptop’s modem. 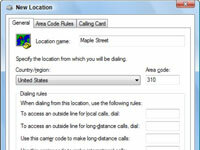 But before you can dial out, you must create a dialing location in Windows. 1Open the Phone and Modem Options dialog box. 2Ensure that the Dialing Rules tab is selected. 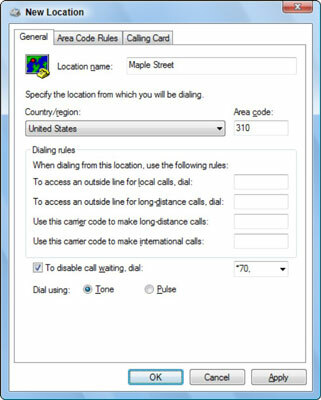 The Dialing Rules tab lists the locations where you use your laptop. My Location is your home base (unless you already renamed it). The New Location dialog box appears. Use it to customize the way the modem dials the phone from any location. 4Enter a name for the location. 5Select whichever country where the location is found. 7Fill in the Dialing Rules area. If you’re creating a location for a hotel and it requires you to dial an 8 before making a local call or a 9 for making a long-distance call, put those numbers into the appropriate boxes. 8Select the To Disable Call Waiting Dial check box and then select the proper code sequence from the drop-down list. 9Finally, select whether your connection requires tone or pulse dialing. Select the Pulse option only if your area is limited to pulse dialing. You’ll be painfully aware of this annoyance; otherwise, you can choose Tone. 10Click OK to save the settings. Windows uses this information whenever you use the modem. It may seem silly to enter this information now, but eventually you’ll have a whole collection of locations. You can save time by using that information rather than have to enter it over and over again when you travel.